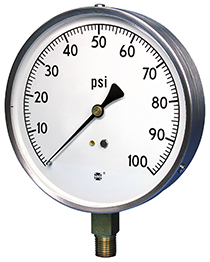 With their rugged, protective stainless steel case, Model 5105 contractor's pressure gauges have been designed to operate safely and accurately in a variety of industrial applications; particularly within the corrosive environments typical of HVAC systems. The dial is easy to read, thanks to its ample 4½” gauge size. And every Model 5105 contractors gauge includes a zero adjust feature.